The freshness of homemade ravioli and the ability to control all of the fillings makes taking the time to make your own, absolutely worth it. And if you have a few kitchen appliances, the work is actually pretty easy. 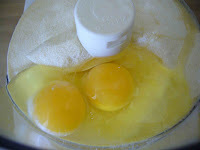 Today I used a pretty common ratio of 1 cup semolina flour, 2 eggs and a splash of olive oil to pull the pasta together. Just add all ingredients to a Cuisinart fitted with the dough blade and let her rip. When the dough forms a ball and starts to clean off the sides of the bowl, the dough is ready. 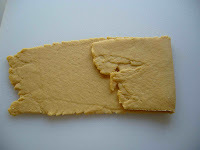 Divide dough into two pieces and flatten into a rectangular disc shape. Wrap the discs in saran wrap and let sit for at least thirty minutes. After the dough has rested, feed it through a pasta maker at the widest setting. 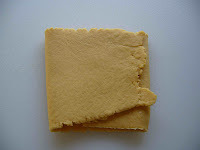 Fold the dough into thirds, as shown, and feed it through again short end first. Repeat folding and feeding it through on the widest setting 4 - 6 times. At this point, I like to cut the piece of dough in half so that the length is more manageable as you stretch it through the machine. Starting on the widest setting, feed the dough through the pasta machine once at each setting, stopping at the second to last setting. 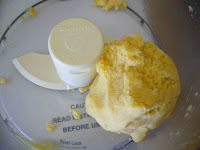 When you're making ravioli, it's better to stop here so that you don't end up with a dough that will tear when filled. There are many ways to shape ravioli, but I prefer an easy method that produces a rustic looking ravioli. Simply lay the dough out on your work surface and place small mounds of filling (the recipe I'm using can be found here) about one to one and half inches apart. 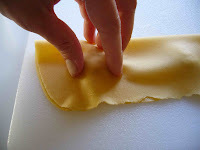 Brush a little water or egg wash around the bottom of the pasta sheet and each side of the individual filling mounds and fold the pasta over the filling. Seal the raviolis by pressing first around the filling and then out to the edges to make sure there are no air bubbles trapped inside. 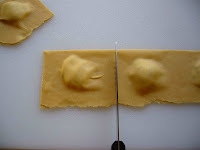 Use a knife to cut each ravioli and transfer to a baking sheet dusted with cornmeal to rest while you repeat the process with the remaining pieces of dough. Fresh pasta cooks a lot faster than dry so these guys will only need about 3 - 4 minutes in boiling water. I try to put them in and take them out pretty gingerly to avoid breakage and remember - don't crowd the pot. It's better to cook in two sessions if you need more room. These raviolis are good as is or maybe with just a sprinkling of parmesan, but I'm going to serve mine with a lamb ragu. Thanks so much for this lesson. 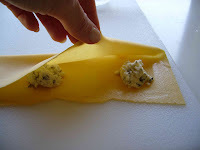 I have a wonderful goat cheese filling recipe, but the one time I tried to make pasta and then ravioli, I was unhappy with the results - I stopped at the second to last setting as instructed by the book I have and ended up with cooked raviolis that were too thick and thus not well cooked. I will try again! I've made homemade egg noodle pasta before. I remember it being a bit tiring to get the right thickness on the pasta. Bet a pasta maker makes it so much easier, right? Maybe I'll get a pasta attachment for my Kitchen Aid mixer one day. I love ravioli.